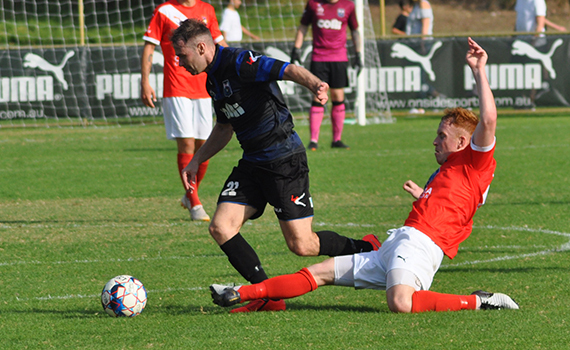 The Jacks have produced a great defensive display to earn a 0-0 draw against Bayswater City at the Campus on Saturday afternoon. The visitors had the better chances on the day but the Jacks held firm with Shane Cassidy and Cian Hirrell outstanding. 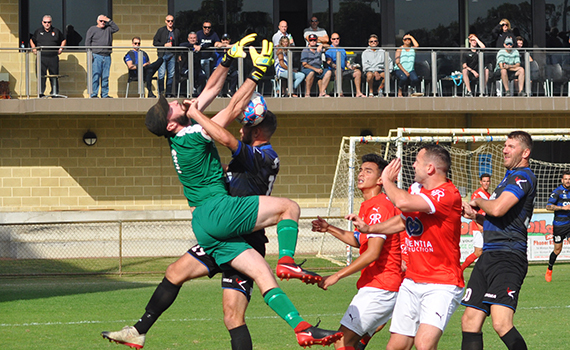 The draw however drops the Jacks to second bottom of the NPL WA table, and sets up a big game next week against Stirling Lions as they continue to look for the first win of the season. Click here to listen to post-match interviews with defender Shane Cassidy and keeper Scott Wallis. 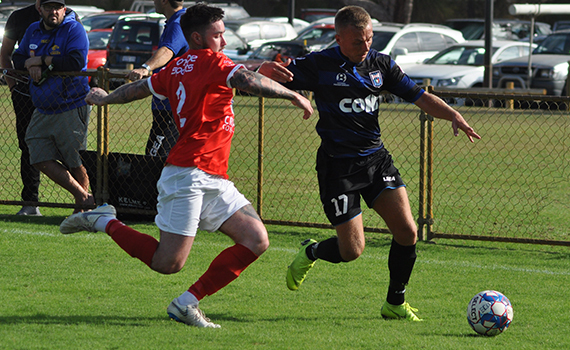 After last weeks 2-2 draw with Perth Glory, Coach Dale McCulloch made two changes, with Cassidy and Josh Whitmore coming into the starting line-up, with Bayley Brown-Montgomery omitted and Richard Howles dropping to the bench. This was a big game for both sides and it was the visitors on the front foot early. Jason Mirco made space down the right and he found Smith in the box, but his shot was well blocked by the alert Ewan Fawcett. It was a tight contest with both sides pressing, but it was Bayswater who went close again on 22 minutes. Nicol was found on the left of the penalty area his shot was saved low by Scott Wallis. The Jacks went close themselves five minutes later, Andy Higgins’ free kick was helped on by Knowles, and Jakub Sklenar’s flick dropped just over the top. Moments later Sklenar was brought down on the edge of the penalty area by Steve Hesketh, a perfect spot for Higgins, but the skippers free kick flashed over the top. Bayswater ended the half the better and the Jacks had Wallis to thank three minutes before the break. Millard’s cross found Smith at the back post, but his shot was superbly saved low by the Jacks custodian, to send the sides in at the break all-square. The Jacks made a change at the break with Knowles struggling with injury, and he was replaced by Howles. Bayswater thought they had a penalty early in the second half, Smith raced into the box and fell under a challenge from Ronald Rixer, but referee Julian Serra was well-paced and waved away their protests, much to the frustration of the Bayswater bench and players. Bayswater were on top, and the Jacks were working overtime to keep them at bay. A long ball over the top sent Giordano Colli in on goal, he held off his marker but his shot well saved by Wallis. Moments later Smith shot on the run flashed inches over the top, before good work from Millard and Smith set up Nicol, but the former Jacks skipper shot was saved by Wallis. It was still anyone’s game and both sides went close as the game opened up. First on 70 minutes Higgins’ corner picked out Rixer but the big defender’s header was just over the top, before Mirco headed over the top at the other end. We entered stoppage time, and after the last two weeks the Jacks bench looked nervous, but they almost grabbed a late goal this week. Tom Hough sent Howles down the right, and his low cross was cleared by Tong, inches past his own goal. From the resulting corner from Higgins, Sklenar lost his marker his header was cleared off the line by Paul Lloyd. But at the final whistle it was a hard-earned point for the Jacks, but a great defensive performance, and one to build on next week away at Stirling Lions. In other games on the day the under 18’s were beaten by league leaders Bayswater 3-1, with Lewis Tucker on target for the Jacks, while the Under 20’s bounced back from defeat last week to end the unbeaten start to the season for Bayswater with a brace from Ben Hinshelwood and another to Callum Speed giving them a 3-2 win.